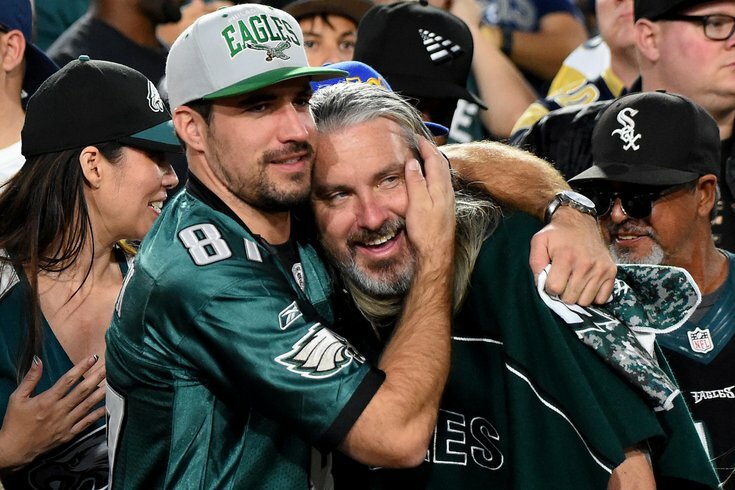 The Philadelphia Eagles’ march toward the Super Bowl is remarkable on a number of levels, but the most overwhelming complement you can give them is that they have used their success to do something truly unique to the world of sports – bring everybody together. You can call it a bandwagon, a tidal wave of support, or a green wave. It doesn’t much matter what title you give this phenomenon, what really matters is that the Eagles’ success is a train of success upon which everybody is encouraged to board. In this tumultuous time when seemingly all of mankind is either lined up on one side or the other, it is encouraging to see something that can appeal to us all. It doesn’t matter what your politics are, what your zip code is, or what your economic status you claim, you are just part of one huge fan base. Perhaps this is even more remarkable when you consider that the theme of so many people through this football season is that they would never again watch the National Football League because of the issue of players kneeling during the national anthem. The league has done its best to massage that issue, but when it comes down to it, the pull of sports and competition temporarily erases the problems of the world while you watch to see which side wins. This is truly the value of sports and this Eagles run into the postseason is a prime example of all the good that sports entail. There are valid arguments as to whether or not cities and states should provide money or tax benefits to exceedingly rich individuals who own sports teams. And there are valid arguments regarding a number of individuals who play in these games (and are rewarded handsomely) whose off-field actions are reprehensible. Yet, much of that can be pushed aside when a team such as the Eagles makes the kind of run that ignites an entire region. You can also assume that the same phenomenon is taking place in Minnesota, the home of this week’s NFC Championship Game opponent, the Vikings. Similar to the Eagles, the Vikings are led by a quarterback, Case Keenum, who like Nick Foles is only in that position because of injury. There is also the issue that the Vikings fans are as cursed as fans of the Philadelphia Eagles, having never won a Super Bowl while being repeatedly dented by misfortune. Just as Eagles fans have enjoyed miracles (as in the Miracles at the Meadowlands), the fans of the Vikings got their own miracle this past Sunday when they punched a ticket to Philadelphia with one of the most bizarre endings in the history of the National Football League. It was an ending that sort of eased the pains of past playoff disasters. Much as in Philadelphia, sports is deeply embedded in Minnesota. The obvious difference is that – as the name would – Minnesota pro sports is statewide and not centered on one city. The franchise reaches across the prairies and it’s likely Eagles quarterback Carson Wentz was brought up watching the Vikings in North Dakota. But if you want to know just how similar the Eagles and Vikings fan bases are, consider the reaction at the Minnesota Wild hockey game on Sunday when the Canadian national anthem was totally drowned out by the howling crowd as the winning touchdown was scored and most were watching on some sort of video device. That is the beauty of sports, entire communities forgetting their differences and howling for the team that wears the name of the city or state. In Philadelphia, that feeling was last truly felt when the Phillies were on their run of postseason appearances and won the World Series in 2008. It was a celebration that went on for months, and for several years, summer after summer, the background music in Philadelphia was the Phillies play-by-play – and the early autumn was way more red than green. Well, the Eagles have become the latest version of a sports team than bonds an entire community. The underdog status that plays in the locker room also resonates across the entire region. Located in the long shadow of New York, it is an especially embraced role in Philadelphia. In this city where the Philadelphia Flyers established the modern day version of a championship parade, and where Rocky quickly followed, it is easy to see why the lack of favored status has also helped a fan base relate to a sports team. The Eagles are a team that has turned a blind eye to potentially derailing injuries to star players such as Hicks, Peters, Sproles and especially, Wentz. The fans have bonded with the team, and the Linc has turned into a cauldron of positive emotion. No matter what happens from here, the 2017 Eagles have already accomplished one of the most important goals of a team in any sport, they have brought an entire community together for a common goal. The guess here is that the Eagles move onto the Super Bowl, but they have already accomplished the greater goal of pulling everybody together in this time of such fractured relationships.